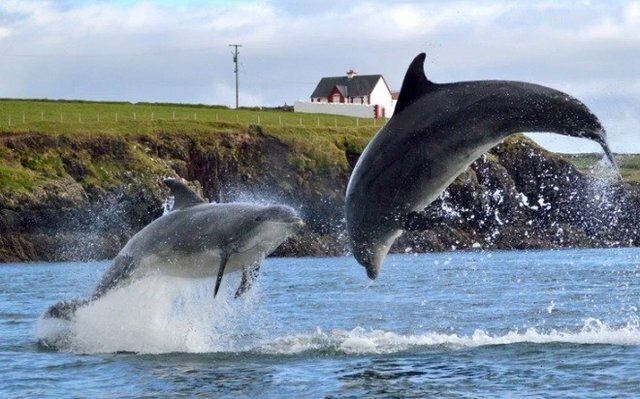 Since 1983, the tiny fishing village of Dingle, Ireland has been home to a solitary Bottlenose dolphin, locals named Fungie. Over the last 30 years, the animal has become something of a tourist attraction, frequently seen happily leaping from the water, and often arriving close to boats and kayaks, seeming to delight in the company of humans. Interestingly, the friendly dolphin's motive for these interactions appears to be purely for companionship, rejecting gifts of food in favor of physical contact -- but only from people. Despite Fungie's gregariousness with humans, Dingle's resident dolphin has been notoriously shy around his own kind. Other dolphins occasionally swim through the fish-rich harbor to feed, though when they do, Fungie almost always keeps his distance. "He has had so many other dolphin visitors this year that he completely avoided - he then hides very close to the rocks and has several other hiding places, or he hides behind our dinghy," says Jeannine Masset, a local photographer for whom Fungie is a favorite subject. Yet for reasons that remain unclear, Fungie's relations with other dolphins have recently warmed. Over the last four days, the normally timid animal has been seen swimming and playing alongside two other dolphins, leaping in tandem like new friends. Fungie's age is unknown, though he was already a mature adult when he first arrived to Dingle three decades ago, which suggests he is much older than dolphins in the wild usually live to be. Regardless, even in his later years, Fungie seems to have no trouble keeping up with the new arrivals, rediscovering, perhaps, a social interest that had long been dormant. "He's definitely holding his own," said one resident.